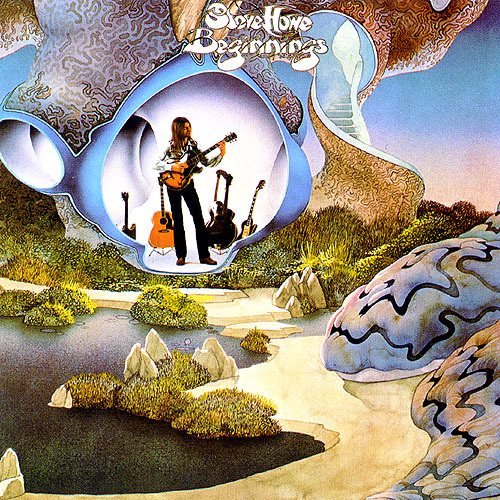 "Beginnings" is the debut solo studio album of the Yes' guitarist, Steve Howe, and was released in 1975. It was one of the five solo efforts released in the same period of time by all the five Yes' members, during a hiatus of time by the band, after the release of their seventh studio album "Relayer", in 1974, along with Jon Anderson's "Olias Of Sunhillow", Chris Squire's "Fish Out Of Water", Patrick Moraz's "Story Of I" and Alan White's "Ramshackled". The album also features some Yes' members, Alan White and Patrick Moraz, and the ex-Yes' member Bill Bruford, besides a large number of guest musicians invited by Steve Howe. "Beginnings" has nine tracks and all songs were written by Howe except the first track "Doors Of Sleep", which was written by Howe with lyrics by Alice Meynell. The first track "Doors Of Sleep" is a kind of a love song, probably a tribute to Howe's wife. It's a song where Howe sings and plays guitars and bass and where we have the participation of White on drums. This is a pretty song with some very pleasant melodies that drift along the song. The second track "Australia" is another song where Howe sings and plays guitars and bass and White plays drums. This is another pretty song with good melody and musically has some good and interesting guitar work. But the main problem with this track is the excessive use of the weak voice of Howe during the song which makes it at times unpleasant. The third track "The Nature Of The Sea" is the first instrumental song of the album, and that is a good thing because we haven't to hear the voice of Howe. It's an interesting musical piece with good guitar passages and it's very interesting to listen to. This song is, in my humble opinion, well constructed and represents, I think, one of the best musical moments on the album. The fourth track "Lost Symphony" is a good composition dominated by the influence of jazz with the appearance of diverse saxophone works and where the presence of the Howe's voice appear only for a bit. It represents one of the best progressive moments on the album and consequently a must for any progressive rock fan. The fifth track is the title track "Beginnings". This is another instrumental song. It's the lengthiest song on the album and is a classical piece of music, with an accompanying section of several classical musical instruments, including a harpsichord played by Moraz. It's also, in my humble opinion, a very well orchestrated piece by Moraz. This song represents Howe's love for the classical music and represents, in my humble opinion, the most beautiful moment on the album too. The sixth track "Will O'The Wisp" is another song sung by Howe but at times we can hear two voices, and I really think that is Moraz doing a backing vocal work. This is a song where Howe plays guitars, bass and moog, White plays drums and Moraz plays piano and mellotron. The song sounds nicely with a very distinctive guitar work, but overall, the song doesn't attract much attention and I also think this is one of the weakest songs on the album. The seventh track "Ram" is the smallest of all tracks on the album and is an instrumental acoustic song in the same vein of "Clap" of "The Yes Album" or "Mood For A Day" of "Fragile". Despite it isn't as good as those two songs are, here Howe, is showing that he can play a great variety of acoustic guitar instruments. The eighth track "Pleasure Stole The Night" is another short song in the style of a ballad. Despite this is a calm and pleasant song, with several singers which are fortunately better, than we have Howe singing on solo. However, it hasn't really great interesting musical moments, and this is the main reason why it becomes the second weakest moment on the album with "Will O'The Wisp". The ninth and last track "Break Away From It All" represents a good way to close this album. Here, we have once more good guitar moments and un-crediting backing vocals. Here, we have more pleasant vocals too. This is the only track that features Bruford on drums. Conclusion: Of the five solo albums of Yes' members, all released between 1975 and 1976, the only one I haven't yet listened to is White's "Ramshackled". I rated Anderson's "Olias Of Sunhillow" and Moraz's "Story Of I" with 5 stars and Squire's "Fish Out Of Water" with 4 stars. "Beginnings" is, without any doubt, the weakest of the all four. I know all these four albums since they were released and I must confess that I always was very disappointed with "Beginnings". It isn't as good as it should be. Definitely, it lacks to it some cohesion, passion and flame, and its music isn't even very well elaborated. It's true that it has some good musical moments and technically the performance of Howe is great and absolutely perfect and irreproachable as ever. However, this is very few and it isn't at the same level that a musician like Howe should be. Anyway, I think the main problem with this album is the vocals. Howe has a very weak voice to sing as his experience on vocals are only when he works as a backing vocalist on Yes. Unfortunately, he hasn't a voice as good as the voice of his colleague of Yes, Squire. I think he has the same problem of Tony Banks of Genesis but Howe's voice is, in my humble opinion, even worse. Without this problem I'm convinced that it would have been a better album. Definitely, this wasn't a great beginning for one of the finest and greatest guitarists of the progressive rock world.